At 12:51pm on Feb. 22, 2011, 5 km below the unsuspecting city of Christchurch, the massive tectonic plates that form the cooling crust of the earth split and ruptured, sending the energy of fifty atomic bombs hurtling through the mantle of the earth, upward into the landscape and down into the swirling core of the planet. In less than half a minute, the massive release of energy devastated the Christchurch city centre, tore down buildings , destroyed the power grid and the water reservoirs, turned suburbs into swamps and forever changed countless lives. Amid the devastation though and the inevitable tragedies of perished lives and wrenching loss , we have seen once again the great resolve and steadfastness of the human spirit rise up in response, tales of courage and selflessness, the great love of people for people, the deep kinship of our race. “It’s absolutely bloody marvellous” said reporter John Campbell as he watched bystanders risking their own lives to pull an injured woman out of a collapsing building. 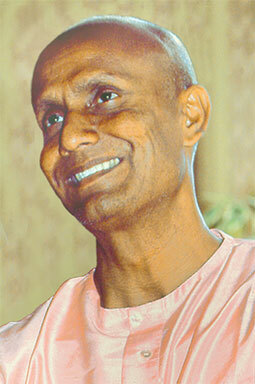 I have been remembering some of the things that Sri Chinmoy said following the tsunamis of recent years and the tragedies in Indonesia and Asia, how these had brought humanity together in a most remarkable way, our self-interests and tribal cultures swept aside in a spontaneous outpouring of empathy and oneness. 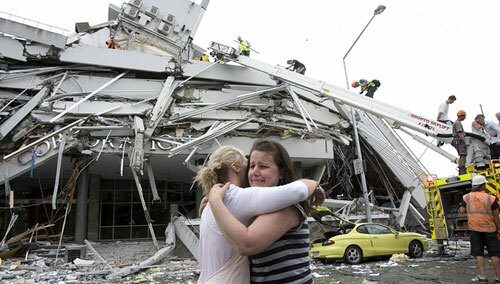 We have seen this so much in recent days, volunteers pouring in to New Zealand from all over the world, search and rescue teams from Australia, the US, Britain and Europe, medical personnel, volunteers risking their lives climbing over the rubble in search of survivors, people opening up their homes all over the country to accommodate homeless strangers, blood donors, locals taking care of homeless animals, donations of food and money. And downstairs in the coffee shop this morning, people far away from the tragedy reading the morning papers and wiping away their tears. And we are grateful, as our Guru Sri Chinmoy urged us to be, that not a single disciple was hurt in a city where 250 are missing, presumed lost under the mountains of debris, 105 others confirmed dead, many hundreds injured, a city – once the most beautiful jewel of our country – in ruins. How deeply moving and encouraging to see the beautiful human soul flying above the rubble, the goodness of the human heart – irrepressible and triumphant – bringing its consoling light and its unquenchable hope into every part of the tragedy. Seeing our human family once again living in the heart the way God wants us to always be. Remembering too that our path is not our enterprises, our meditation centres and assets – these are only some of the fruits of our labour – but our discipleship, our God quest, the inner bond with our teacher which sanctifies our life and raises it up, ennobles it; and our cardinal duty to nourish our soul, the remembering of our oneness with God. Our path is our devotion and our aspiration. Disasters with their awful compendium of sorrows and shattered lives remind us of the great existential truths, the impermanence of all worldly things, the frailty of material happiness, and expedite the inner awakening to finally bring the consolation of sanctuary in God. Christchurch will bind us closer, our human family, offer us glimpses, amidst the rubble of a fallen city of the oneness-world that Guru always urged us to help establish. It will teach us compassion, deepen and widen our hearts, inspire self-offering and remind us of what is really important in our lives. Above the dust and chaos, the despair and grief of a stricken city, the fostering love and brilliance of the heart shines like an heraldic beacon, the Phoenix already arising as it always has from the ashes.